When it’s as hot in Siem Reap as it has been lately (though do we dare for a respite after the last few days of storms), there’s not a great deal you can do except restrict movement as much as possible (mainly so that you don’t skid in great lakes of your own sweat and break important things like a neck), and take in as many liquids as you can. Which sounds like a perfect prescription for going to the pub if you ask me. But because we like to pretend, on occasion, that class isn’t completely out of style, we thought we’d focus on the best spots to go for a glass of wine. And remember, the bucket is for the ice. Chilling out at Le Malraux. The Station on Street 7 changed hands almost a year ago when it was taken over by an Australian fellow who knows more than a thing or two about his wines. As a result, you’ll find here the longest list of wines by the glass in town as well as a huge selection of 100 bottles, which includes some real stars. Wine fans should not dream of missing this place while they’re here. If all this sounds perhaps a little intimidating, the wine list also contains tasting notes on many of the selections to help you make your pick, and deepen your knowledge all at the same time. The Station also hosts ladyboy revues on Friday and Saturday nights, with acclaimed theatrical performances of dance, song and comedy. The shows start at 21:00, but getting there early is recommended. Across the road from The Station, you’ll find Le Malraux. Going here for a glass of wine is more about ambiance than grapes. The wine list is short, but well-selected, and the house wines are excellent and very good value at $3.50 a glass. It’s too rare that you find restaurants with sufficient respect for their customers that they offer them house wines that are this good. But the main reason you go to Malraux is to relax into the classic and romantic continental vibe at which this place excels in creating. Its design is a work of genius and you can choose from an al fresco patio, thickly hung with glorious orchids, or a slightly more formal brasserie setting indoors, or take your place at the long and chatty bar, or the low-slung café style seating in between, whatever takes your fancy. 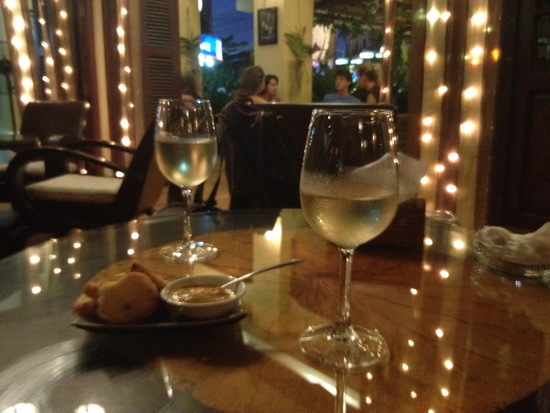 The service is always excellent, and the aperitif snacks that are offered along with your evening drink divine. Picasso is a small wine bar on Alley West with a Spanish theme, and a very convivial U-shaped bar. Their wine list is also short, but the sangria is the star – you can drink and tell your mum you’re getting your daily allowance of fruit at the same time. It may take a lot of sangria to reach the five portions recommended, but if it’s what the doctor ordered… To help you wash down the wine, they also have excellent tapas here, including Iberico ham, olives, roasted red peppers, pickles and, of course, patatas bravas. Real wine hounds should head to the Raffles Grand Hotel d’Angkor, where they boast of one of the largest wine cellars in Southeast Asia. Raffles Le Grand is the only hotel in Cambodia to receive the coveted Two Glass Award of Excellence from the US Wine Spectator, and one of only 833 establishments in the world to currently hold the award; not bad for a hot and dusty town in the middle of nowhere. Last updated on 5th March, 2017.